In this recent video interview with Food Safety News, legal scholar Timothy Lytton envisions a more constructive role for litigation in the next stages of development in food safety policy. Lytton, previously the author of Kosher, describes the three main systems in food safety as (1) regulation, (2) private sector supply chain management, and (3) the liability system (or the tort system). He points out that engagement between regulators and industry supply chain managers has in some ways become more respectful and mutually beneficial. He sees potential in a similar conversation about the role of litigation in food safety policy, including industry managers, the tort system, and insurers at the table. This topic needed a readable systematic summary. 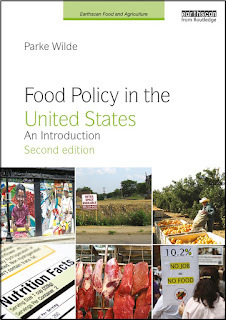 I look forward to Lytton's forthcoming book: Outbreak: the Evolution of the U.S. Food Safety System. What crops to grow in California? In drought-ridden California, 80% of managed water supplies are used for agriculture. You might think that California must consider severe cuts in agricultural production to conserve water. That would be painful, because agriculture is important to California. Just for starters, think of all the farmers and farm-workers whose livelihoods depend on agriculture. Fortunately, it would be possible for California to reduce water use by a lot while reducing total agriculture production by just a little. A new brief (.pdf) from Heather Cooley at the Pacific Institute has two highly relevant figures. 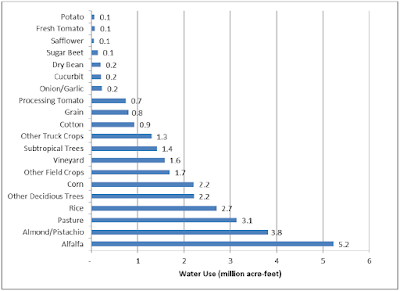 Figure 2 shows that alfalfa is responsible for the most total water use (5.2 million acre-feet). Rice (ranked fourth) and corn (ranked sixth) are also major drinkers of total water. Figure 2. Applied Water for California Crops in 2010. Source: Cooley (2015). Data: CA Department of Water Resources. 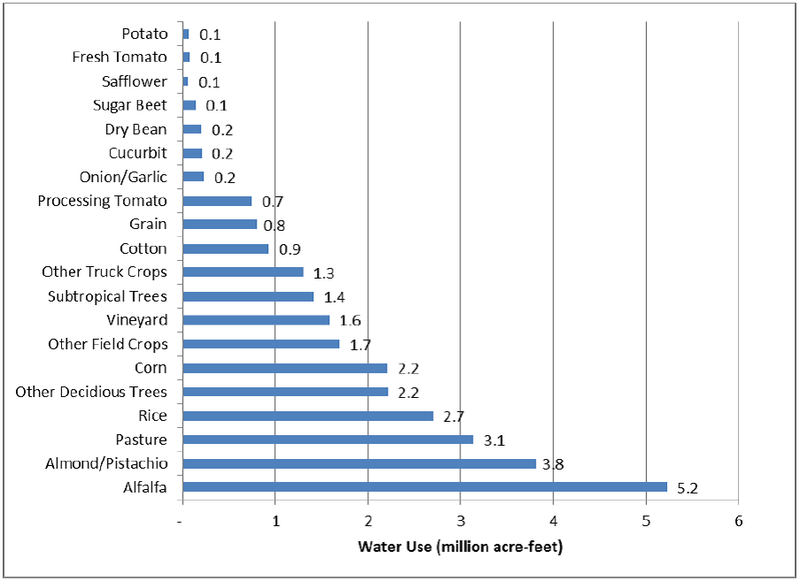 Figure 5 shows that these same three crops -- alfalfa, rice, and corn -- offer the lowest agricultural value per unit of water consumed ($ per acre-foot). Figure 5. 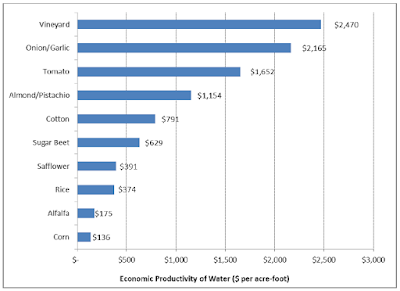 Economic Productivity of Water in 2010 for Select Crops Grown in California. Source: Cooley (2015). Data: CA Department of Water Resources. Though Cooley's accompanying narrative makes the point exceedingly gently, this report has an important implication. If California agriculture reduced water use in alfalfa, rice, and corn by a large volume (in millions of acre-feet statewide), the value of agricultural production in California would fall by a comparatively small amount (in millions of dollars statewide). Alfalfa and corn are important animal feeds in California, so this change would require dairies and meat producers to bring in feed from other states, or reduce their own production. Yet, that could make more sense than growing water-intensive animal feeds in a dry state. How could California reduce the assignment of water to alfalfa, rice, and corn? Having some type of government board make the change would be highly controversial. It makes more sense for the state to remove policies that allow these crop producers to claim water at far below its proper economic cost. These three crops would not disappear from California (certainly not! ), but this sensible policy change would reduce production in these three crops to a degree. If there were unlimited water, we would not need to make difficult choices. But there is not enough water, and hard choices are required. For California, reducing total water for alfalfa, rice, and corn seems like one of the least painful approaches.